Old time radio quiz and game shows were based on a pretty simple premise: although the prizes and the glamor were certainly an important part of the mix. The basic element in quiz shows is that audiences enjoy hearing people like themselves put to a challenge. The form of that challenge would move from differing degrees of gimmickry, but more important than the prizes or the spectacle is the challenge. The quiz show is an ancestor to the reality TV program. Just like reality shows, quiz programs appeal to sponsors because of audience popularity, yet they are cheap to produce in comparison to a scripted drama or a variety show.At times there was some resentment the casts of the other types of shows. 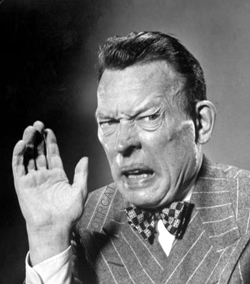 Fred Allen, who had been the king of Sunday nights for years took a terrible beating when Bert Parks’ Stop The Music moved into the same time slot. All radio quiz shows are thought to be an outgrowth of Vox Pop. 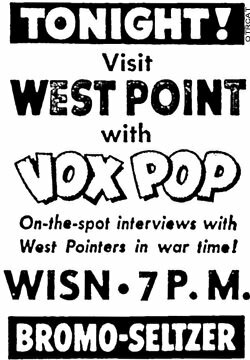 Originally "Man on the Street Interviews," the hosts of Vox Pop would pose a question to passersby and reward them with a crisp $1 bill for their trouble. As the show grew in popularity the format changed. During WWII the program would take place in an auditorium setting, usually at a military installation or defense plant. By this time the sponsors were providing more glamorous prizes, but the challenge of Vox Pop was more about being able to talk to the interviewer in front of the radio audience than competition. Professor Quiz (1936-48), and Uncle Jim's Question Bee (1936-41), both sponsored by George Washington Coffee, are considered to be the original radio quiz shows. The "Stump the Panel" format lent itself to a good deal of merriment. Can You Top This (1940-54) took its inspiration from an old fashioned joke telling session. 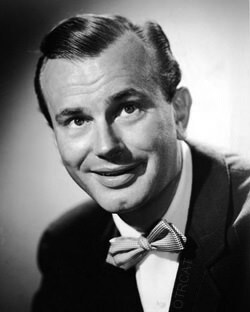 Radio listeners were encouraged to mail in their best jokes, and would win $10 if it was read on the air by host Peter Donald. The studio audience's response would be measured on a "Laugh Meter", and then the three panelists would each tell a joke on the same topic. If their jokes didn't rate as high on the "Laugh Meter", the sender would win and additional $5. It Pays to Be Ignorant was not a old time raido quiz show per se, rather it was a spoof of the high brow panel shows like Information Please. Even if prizes were awarded, the program is great fun. 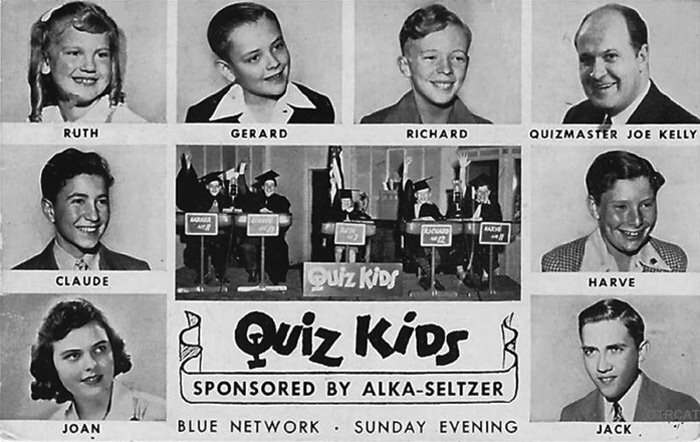 Another panel quiz show program that was well received was Quiz Kids. This is another example where the questions were sent in by listeners, this time the idea was to stump a rotating panel of very intelligent and entertaining youths. The kids were chosen for their personality as well as their intelligence. The five that are on the program in a particular week are each awarded a $100 savings bond to apply towards future education. The two kids who answer the most questions correctly would be invited to return next week. Mind Your Manners,hosted by Allen Ludden, also featured a panel of young people who would answer questions about etiquette and problems faced by teenagers.More of a panel discussion than a old radio quiz show, the listener who sends in a question that is read on the air would receive $5, and the most interesting problem of the week would receive $25. Ludden also hosted a program with older kids, College Quiz Bowl. Four person teams from various universities would compete, answering questions covering general knowledge. The student teams would broadcast from their respective schools, while the host was in the New York studio. Each team would have a buzzer to determine which would get the first to answer the questions. General knowledge questions formed the basis of several popular question and answer programs. 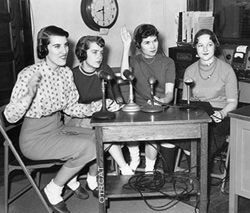 The old time radio programs were popular because the listening audience was able to test themselves against the contestant on the air, but they were driven just as much by the personality of the host. The classic example of the personality driven quiz show is You Bet Your Life with Groucho Marx. The concept for You Bet Your Life was a hard sell to the networks at first, even Groucho had to be convinced it could work. 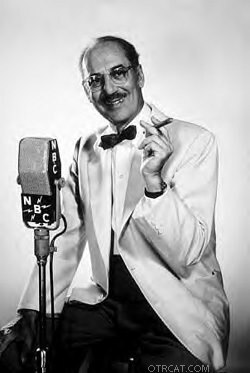 Producer John Guedel recognized that Groucho would be great with a live audience. The classic radio show was unscripted, but to be sure that the best laughs and bits were captured, it was prerecorded, and parts that failed or were less funny than others were edited out. Take It or Leave It (1940-50) began on CBS following the success of Professor Quiz and Uncle Jim's Question Bee. Contestants would be asked a series of questions, each designed to be more difficult than the last. A correct answer to the first question would win $1, but the prize amount would double for each of the following questions, until the highest level, $64, was reached. At anytime the contestant could quit and take his winnings, or risk the double on the next question.Take It or Leave It would be repackaged for television as The $64,000 Question, which became notorious for it's involvement in the quiz show scandal of the 1950's. Break the Bank, hosted by Bert Parks, also used the progressively increasing prize money model. In this case contestants had to answer eight questions before they missed two. If they answered enough questions correctly, they had a chance to "break the bank" by answering a final question. The bank began with $1,000, but every week that the question went unanswered, the amount increased. 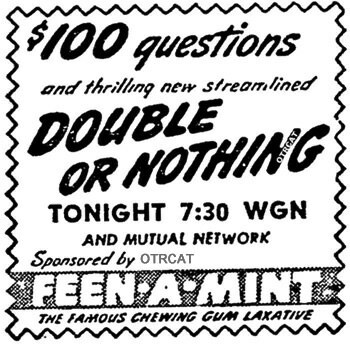 In Double Or Nothing the old time radio contestant would be asked an opening question, and then told to ad-lib on the subject of the answer. The host would award a small amount of cash for each item the contestant was able to come up with during the one minute ad-lib. Finally they would be given a final question which, if answered correctly, would double their winnings. General knowledge contests were notalways about the cash, sometimes they were about family. 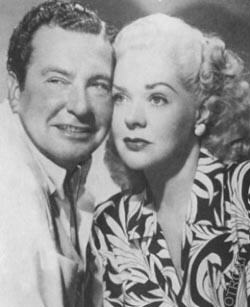 The Better Half (1943-49) was a battle of "Brains, Brawn and Beauty" to determine if the husband or the wife was the better half of the family. There was a small cash prize, but the big prize would be braging rights. It Pays To Be Married (1953-54) honored the American home: most of the program was dedicated to hearing the stories of married couples who had solved problems in their marriage. After telling their story they are awarded with gifts from the sponsor.At the end of the old radio game show program the couples are given the chance to compete for the Family Fortune Jackpotby answering a general knowledge question.The jackpot would contain large prizes, such as major appliances, and $250 cash. 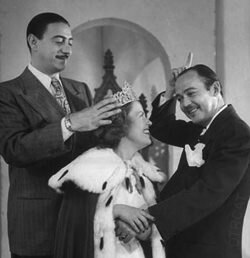 Queen For A Day (1945-57) played on audience fascination with large prize give-aways, but it did have an element of competition. The lady contestants would have to talk about a real emotional or financial hardship they endured. The studio audience would judge the favorite story with the use of an "Applause Meter," and the teller of the winning story would be showered with gift, as well as having the show (using the sponsor's money) do what they could to solve the problem. 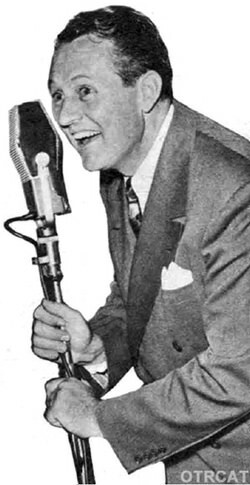 Kay Kyser's Kollege of Musical Knowledge was part of the his night club act before he was picked up by the Mutual network in 1938, then the show moved NBC from 1939-49. The "Ol' Perfesser" would ask the contestants a series of questions, and the band would give hints in the form of songs. Beat the Band (1940-41, 1943-44) attempted to be a musical version of Information Please. Listeners would write in questions that would have song titles for answers. If their question was selected they were awarded $10, and if they stumped the band they won $25. Puns and riddles were very acceptable questions, and the band was in competition with itself as well; each musician who gave a wrong answer had to toss a 50 cent piece into the bass drum, and at the end of the show, whoever had the most right answers got the stash. Second Chance (1953-55) had a generally more serious tone. Like the earlier Queen for a Day, the show used the troubles of others as a hook. Contestants would tell stories of mistakes or misfortunes in their lives. These could be somewhat light hearted, like the Texan who had left his fiance at the alter but now wanted a second chance, to people who had lost everything through substance abuse. After they tell their story the contestant is asked a series of "Win or Lose" questions,which lead to a "Second Chance" question which can double their money. Stunt shows allowed people to make fools of themselves in a good sported way. Truth or Consequences (1940-56) was inspired by a parlor game. The host would ask a very difficult general knowledge question, and when the contestant was unable to answer, he had to face the "consequences". This was usually in the form of a comic stunt. Sometimes writers would spend weeks or months setting up jokes on the contestants, enlisting the help of the contestant's friends and family members. On People are Funny (1942-60) the stunt would seem embarrassing enough to when the contestant agreed to it, but then the audience is let in on the secret that there has been a twist added to it, effectively double crossing the contestant. Sometimes the listening audience was called upon to play the game. The prize for Mel Blanc's Are You a Genius (1942-43) was mostly bragging rights.The old time radio program was directed towards servicemen over AFRS, they were instructed to get a pen and pencil to record their scores, and Blanc,using several of his cartoon voices, would give a very entertaining intelligence test. Unlike as radio westerns and old time radio soap operas, radio quiz shows did not transfer well to television the way other genres, There are a few exceptions, such as Truth of Consequences and You Bet Your Life. The quiz or game show did become a TV staple of its own. One which made the unusual move from TV to Radio was What's My Line?, which would go on to be TV's longest running prime-time game show. Marlene Dietrich and Marlon Brando made their only appearances on the radio version of the show. The television quiz program genre became embroiled in scandal during the mid-1950s when it came to light that several of the most popular prime-time quiz shows had been fixed in order to increase ratings. One of the shows wrapped up in the scandal was The $64,000 Question, which was an updated version for the television audience of Take It or Leave It. Radio quiz shows continue to be popular to this day with radio DJ's offering money and prizes to listeners who call in with the answer to a question. 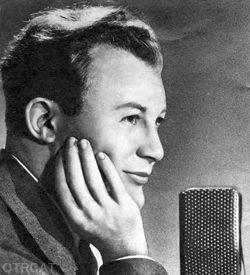 Today, old time radio quiz shows offer the excitement of listening to a quiz show and the charm of hearing the voices of regular folks some 50, 60, or 70+ years ago. 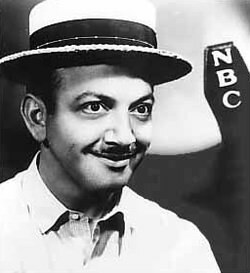 Are You a Genius 1942-43 Mel Blanc Zany Mel Blanc does a one man show for the troops, asking them to get a piece of paper to keep their score. Mel then reads the questions and assigns a point value for the right answer. The goal is to get a score as high as the host, 100 points, But Mel has the answers in front of him! Beat the Band 1940-1941, revived in 1943-1944 Gary Moore Send in questions which have a song title in the answer. Puns were encouraged. Featured vocalists included Perry Como, Marilyn Maxwell, and Parker Gibbs. $10 If your song is chosen, $20 and a case of Kix if you stump the Band. In addition if a musician got the question wrong he had to through a half dollar in the bass drum, the musician who got the most questions correct got the kitty! Break the Bank 1945-1950 Bert Parks Contestants are drawn from the audience. They are required to answer 8 questions before missing two. First correct answer is worth $25, then $50, $100, $200, $300, $400, $500, and finally the "Break the Bank" question. If the contestant miss two questions their prize money goes into "The Bank." All the money in the bank, which begins at $1000, but each losing contestants prize money is added until there is a winner. Calling All Detectives 1945-1950 Paul Barnes "The Sealy Mystery Quiz". Paul Barnes, "the Man of a Thousand Voices" does a one man show presenting a short detective play. 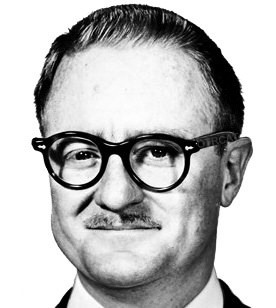 After the mystery, Barnes calls a listener in the Chicago area and asks a question about a detail of the story. $25 dollars if your are called and can answer the question, if the question is not answered the $25 is added to the next day's prize. A $5 consolation is presented to those who answer the phone but not the question. Can You Top This 1940-1954 Peter Donald The host reads a joke submitted by mail, and it is rated by the studio audience using the Laugh Meter. The "Knights of the Clown Table", "Senator" Ed Ford, Harry Hershfield, and Joe Laurie Jr., would each tell a joke on the same topic, trying to top the rating of the first joke. Jokes submitted won $10, If the panelist tells a joke that does not top it on the Laugh Meter, $5 dollars is added, for a possible $25. Double or Nothing 1937?-51? Various Guests are asked an opening question, the answer is worth $5. Then they have one minute to ad-lib on the topic of the question, and earn money for each statement. After the ad-lib they are asked a final question, the correct answer double their winnings. War bonds and Stamps. It Pays to be Ignorant 1942 - 51 Tom Howard Spoof of more high brow shows like Quiz Kids and Information Please. the show featured "a board of experts that are dumber than you are and they can prove it." The prize is more laughs than almost any other half hour. It Pays to be Married 1953-54 Jay Stewart The show that honors the American Home. Couples are interviewed then given some very nice gifts. At the end of the program the couples that appeared compete for the Family Fortune Jack Pot by answering a question, first to answer wins, if no correct answer the prizes roll over to the next episode. The gifts and the "Family Fortune Jackpot" may include jewelry, major appliances, expensive clothing, lawnmowers, and cash. 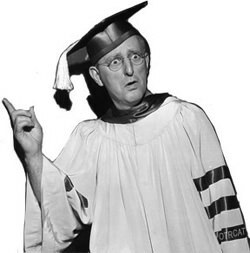 Kay Kyser Kollege of Musical Knowledge 1937-1949 "The old professor" Kay Kyser takes his act to several military Bases with lots of jokes. The "Ol' Perfesser" would ask a "Student" from the audience of servicemen a question, and the band gives a hint with a song. Mind Your Manners 1948?-49? Allen Ludden Allen Ludden host a panel discussion about etiquette problems faced by teens. Questions are submitted listeners. The final segment is for listeners to write in their answers posed by the show (Should Boys were a tie on dates?) $5 in savings stamps to the letter writer who sends in question that is answered. $25 Savings bond awarded to the weeks most interesting problem. People are Funny 1942 - 1960 Art Baker Participants are encouraged to perform various stunts or tasks, most of which are embarrassing, and all of which require a good deal of humor! Usually a member of the audience is sent out ot the studio to perform a stunt and will be double crossed, which adds to the comedy. Various prizes: cash or gifts, depending on the degree of embarrassment in the stunt. Queen for a Day 1945-1957 Jack Bailey The queen candiates are interviewed, and tell their wishes. After the "Royal Jewels" and other prizes are listed, the finalists are chosen by audience applause. The queen's wish will be granted, plus a beauty make over, a fancy lunch and dinner, and the crown jewels. Quick as a Flash 1944 - 51 Ken Roberts Different puzzles and games are presented to the six contestants. They can buzz in when they have the right answer. Prizes are bigger for each game, leading to the mystery sweepstakes. The different puzzles are worth different amounts, begining with $21. The "Mystery Sweepstakes" is worth $101, but the prize is progressive, growing each time the mystery isn't solved. 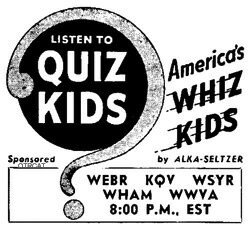 Quiz Kids 1940-1953 Joe Kelly Questions are sent to the show from listeners. The kids on the panel are chosen for their personality and intelligence. Listeners whose question is chosen will win a Zenith Radio, if the question is answered correctly the prize is a an Oceanic Portable. If the Quiz Kids are stumped the prize is a Home Console set. The panelists receive a $100 Savings Bond for each appearance, the two who answer the most questions correctly are invited back while the rest of the kids rotate. Second Chance 1953-1955 Johnny Olson Each contestant has had a personal tragedy or made a large mistake in life, but are trying to make good. On the show they are given a "Win Or Lose" Question for $10. The "Second Chance" question can double the value of the prize and the following questions. Contestants whose letters are chosen to be read on the air receive a $100 savings bond in addition to the prize from the quiz. Twenty Questions 1946 - 1954 Van Deventer family The program works just like the game we've all played with our families, the Ronson mystery voice gives us the word and the panel has to guess in Twenty Questions. The word is sent in by listeners, who win a prize for their contribution. Ronson Lighter form the sponsor, a portable lighter for the chosen subject, and a Ronson Table set if the subject is not guessed. Vox Pop Parks Johnson, Warren Hull Originally "Man on the Street Interviews", but later programs feature auditorium settings. Participants are selected and interviewed by the hosts. War Years shows are staged at military bases and defense plants. A special treat is the Vox Pop phone call, usually a long distance call between a service man or woman and family. Not so much of a quiz or contest, however participants who lend Vox Pop are given terrific prizes by the sponsor. What's My Line? 1952- 1953 John Charles Daly The panel members guess the occupation of the guest using Yes or No questions. The contestant wins for 10 No answers. Each No answer is awarded $5, for a possible prize of $50. You Bet Your Life 1947 - 56 Groucho Marx Groucho interviews guests selected from the audience who have been paired by the producers. They will be asked several questions, betting that they can answer correctly. The show is unscripted, but it was prerecorded and edited, so that the best jokes and bits are used. $100 for the guests to share if they say "the secret woid"
Spoiler : I have a soft spot in my heart for these old radio quiz shows. They\'re remarkably charming and funny.